The color ramps provided by Smart Mapping defaults are keyed to the basemap you are using so everything will harmonize. The February update to ArcGIS Online introduced an exciting new capability: Smart Mapping. 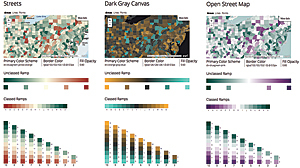 This is a new approach to making maps that are both useful and visually stunning. To do this, this update adds new ways to symbolize data, smart defaults, and data-driven workflows to the ArcGIS Online map viewer. Esri wanted to simplify mapmaking by taking the guesswork out of choosing from among hundreds of potential settings and providing defaults predicated on the map context, resulting in maps that are both cartographically appropriate and beautiful. This also means you can make maps more quickly because fewer iterations will be required. This does not take control away from map authors or dumb down the map authoring experience. Mapping pros still have full control over the process. Smart Mapping just provides better initial parameters, such as colors, scale, and styling, that fit the data and map's story. That's why it benefits novices and experts, making both more productive. 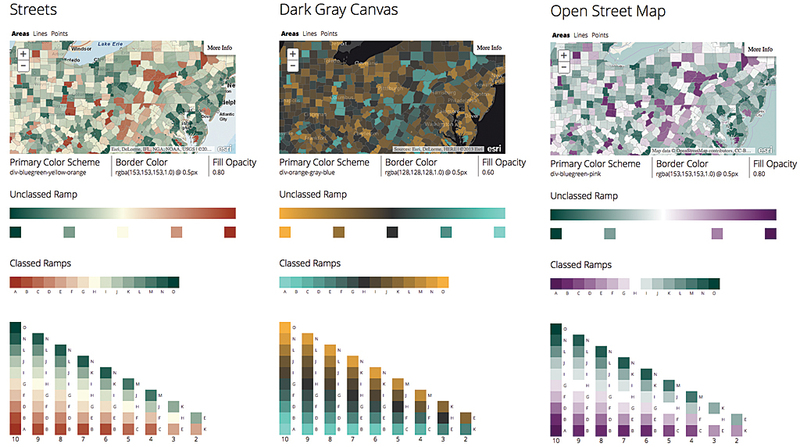 Continuous color ramps and proportional symbols, improved categorical mapping, heat maps, and new kinds of bivariate maps that use transparency are delivered through a streamlined and updated user interface. A new gallery browser in the map viewer for identifying the best ways for representing the data in the map. Automatic determination of appropriate maximum and minimum zoom levels for the map. Setting scale limits properly is essential but can be tricky. ArcGIS Online handles this for you. ArcGIS Online automatically picks the right colors, line weights, opacity, and other styling to harmonize with the Esri basemap being used. Esri embraced a live styling philosophy so any changes are immediately visible on-screen. The February update will also include enhancements such as metadata support, a new custom role privilege, and support for the Greek language. See a complete list of features in this release.